This month, Wal-Mart sent a small shock-wave around the world of logistics and warehousing by revealing that it was testing drones to take inventories of its distribution centers. With the ability of data drones to do in a single day what humans must do in a month – at vast cost, and often in risky high-level man-cages – the move signaled a supply chain management future in which large warehouses will need to use aerial scanning of products for logistics and bulk distributors to maintain their competitive advantage. No one yet has a fully-automated, product-ready drone system to replace people in mapping the precise location of the thousands of stock pallets stacked in the giant racks of the world’s large warehouses. But one South African start-up, DroneScan, has emerged as a player on the leading edge of the inventory revolution, with its ability to precisely map and scan the contents of warehouses. The DroneScan platform can not only safely and rapidly count the products in a warehouse, but can also immediately map exactly where every product is in the maze of racks – and can do so 100 times faster than manual counts, involving forklifts and elevated platforms. 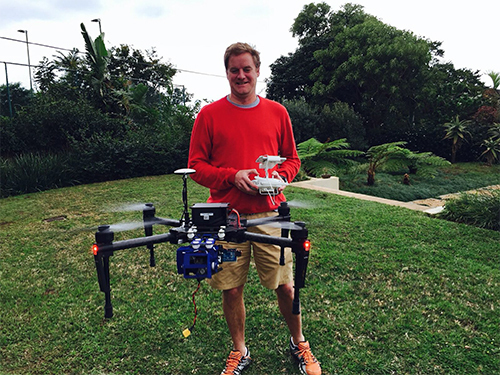 Last month, a leading South African investment firm selected Dronescan as one of just 13 start-ups among 130 with the potential for major global expansion. Already, a global multinational company in the food space, based in Europe, is using DroneScan at a large pilot site. Now, the company is seeking U.S. partners – ideally, 3PLs or 4PLs or large end users with research sites – to use the platform in determining their own optimal solutions as the revolution unfolds, as well as a U.S. investor who recognizes the growth potential in this space. Electronic engineer Craig Leppan – a co-director in the company – told SABLE that the new speed and efficiencies required in the new, data-driven economy simply requires an urgent exploration of much faster stock-taking methods in the industry. While product-ready systems could be ready in 2017 – and a fully autonomous system later – Leppan says the current platform is designed for project testing. “We are saying that: Buying essentially this accelerator kit from us, you can get a start on this revolution,” he says. “We have a very strong product that works, that you can test, and clearly asses its value. We are seeing some interesting enquiries out of the U.S.; its just such a big market and we think – based on our features, and the choice of our technology by our multinational customer in Europe – that we are quite well ahead of the curve. We have also been in conversations with a major 4PL in Australia." Like co-founder Jasper Pons, Leppan, 47, is an electronic engineer by training, and he says that the homegrown electronics suite on the platform has produced a robust and reliable system. The DroneScan website offers a delightful, blog-style R&D story, in which Pons recalls: "Three years ago I walked through a large warehouse and watched a team of 80 people use forklifts and handheld barcode scanners to perform inventory counting. This mind numbingly boring work ruined their weekend and shut the warehouse for 3 days while all 50,000 boxes were scanned. I set out to design and build a flying scanner that could alleviate the boredom of these workers, and give them back their weekends." Later, he adds: "I didn't realize how much soldering, crashing, wiring, testing, burning electronics, broken propellers, late nights, online shopping, researching, importing, skyping to product experts, testing of sensors, 3d printing, 3d drawing, programming, coding, hacking (and whatever other word there is for software development) was needed in designing a system like this. Three years later it is finally ready to start work in a warehouse." In addition to solving safety risks and liability costs, Leppan says speed it the key. "You can imagine that with the speed of a forklift: once you have turned a meter left or right, the drone will have already scanned and have moved on twice. Its about data agility. Translated to time, companies are asking: 'What does it cost to do an inventory only once a month, versus once a week, or every day?' We’ve spoken to a company that had an order for a $40,000 pallet of product that had to go out immediately – and they had no idea where it was. Leppan says one reason the company is looking to the U.S. is that – while companies in smaller markets like South Africa can only afford to entertain product-ready solutions – warehousing companies in the West know they need to test future solutions to maintain their competitive advantage. Leppan said that – like many leading-edge South African tech start-ups – DroneScan was looking to the SABLE community for network contacts, in-country expertise and a soft landing within U.S. markets. “I saw Donovan Neale-May at a conference in Cape Town, and was really struck by the strength of the South African business connections in the U.S., and how they understand what South African entrepreneurs can offer partners and markets over there,” he says. “We’ve been through due diligence with some investors, and were gratified to have been chosen among those seen to have the potential to go global; really go big. Yes, we are a start-up, but it is built on top of an established scanning business – where Jasper has been involved for 20 years. Leppan says his ideal scenario for the end of 2016 was 6 concurrent pilot projects, using the DroneScan system. “For the balance of the year, what would be most interesting for us is to connect to a similar project we have in Europe. A customer who says 'we have enough R&D budget to figure out the solution' – and with Walmart saying they’re investigating in this, other guys will be saying: we need to look at this as well." “What we offer is a pilot, to say we can provide you with the accelerator – you won’t have to build an scanning assembly for a drone and figure out how to do it.” He says DroneScan has set aside 10% equity for a western investor; an investment which would trigger two new streams: a technical team for fully automated flight, and also new capacity on scanning technology, where the company already has a product with two decades’ experience. Leppan says DroneScan is designed for distribution centers with uniform product pallets: stock such as food, tobacco, beer, or detergent. He explains that it is not yet suitable for small items, or for high-value items with discreet diversity.